Discussions Magazine Music Blog: CYPRESS HILL/Rise Up: Available April 6th, 2010! 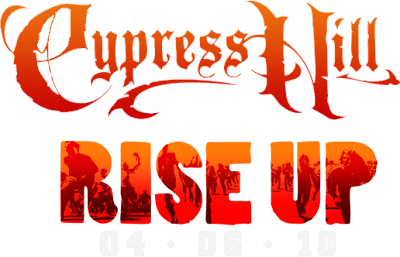 CYPRESS HILL/Rise Up: Available April 6th, 2010! Los Angeles, CA (February 22, 2010) – CYPRESS HILL returns April 6th with RISE UP (Priority/EMI), an album whose thrilling mix of deep grooves and hard riffs are amplified by guest appearances from Rage Against The Machine/Street Sweeper Social Club guitarist Tom Morello, Linkin Park vocalist Mike Shinoda, System of a Down guitarist/vocalist Daron Malakian, singer-songwriter Marc Anthony, rapper Pitbull, Everlast, Young De, Evidence, The Alchemist and comic legends Cheech & Chong. The album spotlights not one, but two lead singles: the incendiary title cut “Rise Up,” which features Tom Morello (who co-wrote and co-produced the song) and “Armada Latina,” a hip-hop-flavored track spiced with vocals by Marc Anthony and Pitbull and production by Jim Jonsin (Lil Wayne, Beyonce). RISE UP is Cypress Hill’s first new album in six years and the first release being issued through Priority/EMI. Priority Records Creative Chairman Snoop Dogg signed the band to the label. The follow-up to 2004’s Till Death Do Us Part, RISE UP was recorded over the course of the past three years at B-Real’s studio, The Temple, in Los Angeles. Cypress Hill (emcees B-Real and Sen Dog, DJ Julio G and percussionist Eric Bobo), is one of the most successful and influential hip-hop/rock groups in music history, with more than 18 million worldwide sales, an amazing string of chart-topping hits and an international fanbase whose members number in the millions. They’ve headlined Lollapalooza, been named “Best Rap Group” by Rolling Stone, collaborated with the likes of Pearl Jam and Sonic Youth, hit No. 1 on the Billboard Top 200 Albums Chart and have had their music licensed for a plethora of TV shows, commercials and films. Cypress Hill was also the first Latino hip hop group to be certified platinum.